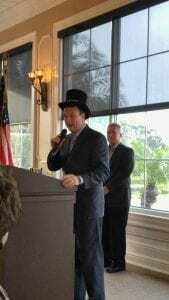 Shawn Foster received the official Honorary Governor of West Pasco top hat at the West Pasco Chamber of Commerce Breakfast on July 22nd. Foster raised a total of $28,054.04 with $14,507.02 given to his charity of choice, Pasco Kids First. 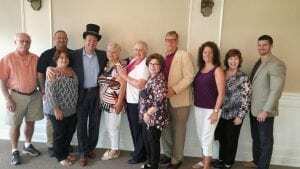 The 19th annual “Honorary Governor of West Pasco” competition, sponsored by the West Pasco Chamber of Commerce, is a fundraising effort for the Chamber and the charities chosen by the candidates. The other candidates were Ken Watkins representing SPCA Suncoast and Mark Wickham represented Youth & Family Alternatives. The community came together and supported all three candidates raising more than $48,300 and $4,800 in labor and supplies for kennel renovations for SPCA Suncoast. 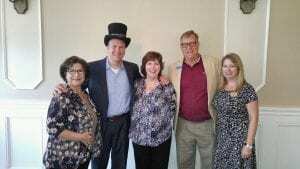 The West Pasco Chamber held two joint events with all three candidates including a kickoff debate and a Governor’s Olympics. 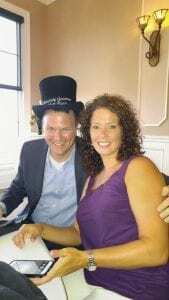 Foster held several fundraisers throughout the three month race including a kickball tournament, a Ladies Night and Fashion Show event and a Cinco de Mayo Mega Raffle drawing.